There are many things you can do to make your sofa look better, including getting new upholstery for it or buying an elegant cover for it. Your chairs also need to be cleaned or replaced. Before you do so, it may be a good idea to first take a serious look at giving them a good professional wash using upholstery cleaning service techniques. There are 5 benefits that an upholstery cleaning expert can advise you on that would take care of the accumulated mess and dirt your upholstery has suffered over time due to the disregard your dog, cat or family have had for your furniture throughout the years. Whether made from fabric, leather or wood, your furniture will need to be cleaned at least once a year, if not more. Pets and small children, shoes and dirty plates that were left on the upholstered items, now and in addition to being dirty, also make your piece smell awful. Upholstered items that are cleaned and deodorized will look and smell fresh once they undergo a special cleaning treatment. You want to make those upholstered chairs look new, but you don’t want to re-upholster them. The next best thing would be to have them shampooed and treated professionally. The brightness will come back as the dirt and spots have been taken care of. Most times if the upholstery is not very old, a good wash will make the colors come out and those upholstered chairs will shine again. 3) How durable is your Couch? Many people love having couches in their homes since it’s always nice to lie down on one and relax after a long day away from home. The more you clean and take care of an upholstered couch or sofa, the better and longer it will last; the dull fabric look will go away and if treated well, good upholstery cleaning will extend the life of any piece of furniture. You probably didn’t know that mattresses are not the only things that attract dust mites. Dirty chairs and sofas can also be a source for those little microscopic creatures. 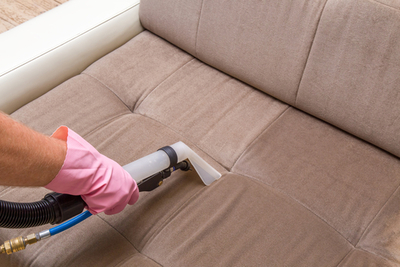 If you use professional upholstery cleaning services however, you can be guaranteed that dust mites will not find a permanent home in your upholstered furniture. Fabrics and upholstery in general can be the cause of some allergies in the long term, especially if they have soil and dust that go into them every time someone sits on them after having lied down on the grass or sat on an outdoor wooden bench. Contaminates will cling onto your clothing and then be brought into the home. One way of getting rid of exposure to allergy causing bacteria and pollen is to regularly benefit from professional upholstery cleaning. Usually the best time of the year to start upholstery cleaning is in the spring. Many people try to do a good job on their own, but it seems the professionals have the experience and tools to do a better job. There are companies that use natural ingredients to get the job done, such as using citrus solutions that are made from organic and natural fruits. Nowadays most upholstery cleaners use safe and chemical free cleaning solutions to get your upholstery stand out and look their brightest.